We welcome you to Poland, Master Leonard ! Pure magical night. There are no words to thank you Leonard only stay with hearts and arms opened wide. And the Band is extraordinary all together and every one of them in person. The miracle has come true tonight in Wroclaw. Heart With No Companion! You lucky lucky Poles. I love that song. martali wrote: Pure magical night. I just came back from Wroclaw. Hard is for me to tell something more except "magical". But I try. First. It was something more than I used to know. A little bit different Cohen. More music flowing than ever. Old songs as new. Newer songs as recent songs. I remember Poznan concert in 1985. This one was like another world. Different time, different atmosphere but much, much better music. Concert was also much longer. Audience did recognize him I think. And I did. More than once with happy tears in my eyes. Thank You, Leonard, thanks to all The Band. You gave us The Night. In my humble opinion no one could ask for more. Hi Mirka and thank you SO much for sharing the You Tube video of Anthem! Whoever shot the footage did a very good job and as always, Leonard is awesome and touches ones heart to the core. I still have chills after watching it! I am looking forward to seeing him in Copenhagen in exactly 18 days! Thanks again. Oh in the Tower of Song"
What could I say... it was definitely worth waiting 23 years. My hair is grey but I still admire The Master. The concert was just brilliant. I was mesmerized by both the music and The Voice. Leonard seemed to be more and more energetic as the time went by. That was really amazing - he seems to acquire the energy directly from the hearts of his listeners and followers. Is this Magic? Probably yes. 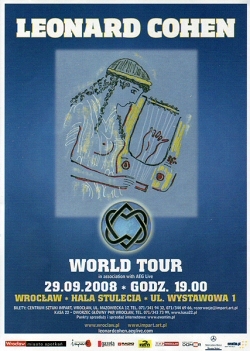 At that night Hala Stulecia in Wroclaw was the real Tower of Song. Let me wholeheartedly thank you, Leonard, for sharing your music with us. Thanks also to all the amazing musicians, especially lovely Webb sisters (white girls dancing.. ). Their voices are absolutely marvellous and they are soooo charming and pretty. Anyone can fall in love instantly. (hope my wife won't read this ). Javier Mas is really a master of string instruments. We also loved Dino Soldo who seemed to have very good time during his solos. The arrangement of all the songs was also very good. As for the audience - I was slightly disappointed. The applause was OK, but I expected a bit more, at least people singing some of the most popular choruses (like "Hallelujah", "So long Marianne" or "Closing Time"). Once again - thanks Master Cohen for the magic evening. I really hope you won't let us wait another 23 years for the next concert here. Remember - we're "thy people" and you're "our love...". Last edited by Mirek on Wed Oct 01, 2008 2:22 pm, edited 1 time in total. "I do what I'm told"
"I buy the greatest hits"
Last edited by mnkyface on Thu Oct 02, 2008 10:10 am, edited 1 time in total. "I love your body and your spirit and your clothes"
Leonard Norman Cohen was born in Montreal in 1934 (on September 21). His father, an engineer who owned a clothing concern, died when Leonard was nine. He went on to attend McGill University, where at 17, he formed a country-western trio called the Buckskin Boys. He also began writing poetry and became part of the local boho- literary scene, a scene so "underground" that it was bereft of "subversive intentions because even that would be beneath it." "His first collection of poetry, Let Us Compare Mythologies, was published in 1956, while he was still an undergraduate. The Spice Box of Earth (1961), his second collection, catapulted Leonard Cohen to international recognition. As a writer Cohen has been active during the whole decade of the 1990s. In 1993 he published Stranger Music, the most complete text available of his poetry and songs. His new poetry written on Mount Baldy, India, Hydra and Los Angeles is waiting to be published in 2006 in the Book of Longing. Many of those poems are available on this site, in the Blackening Page section.